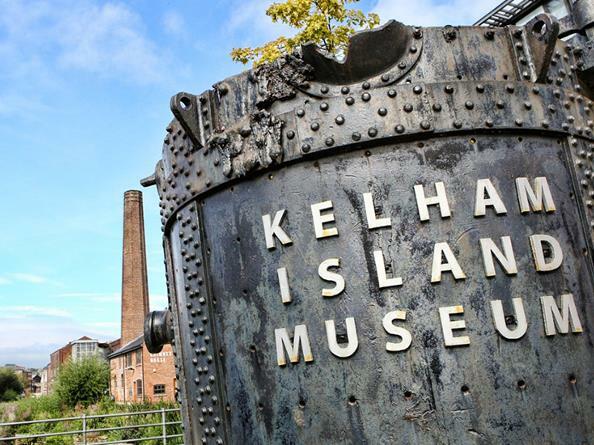 Kelham Island Museum was opened in 1982 to house the objects, pictures and archive material representing Sheffield's industrial story. Located in one of the city's oldest industrial districts, the Museum stands on a man-made island over 900 years old. Come inside and explore our new look Museum amidst the sights and sounds of industrial Sheffield. Wander through our inetractive galleries telling the story from light trades and skilled workmanship to mass production. Learn what it was like to live and work in Sheffield during the Industrial Revolution and follow the growth of the city through the Victorian Era and two world wars to see how steelmaking forged both the City of today and the world! 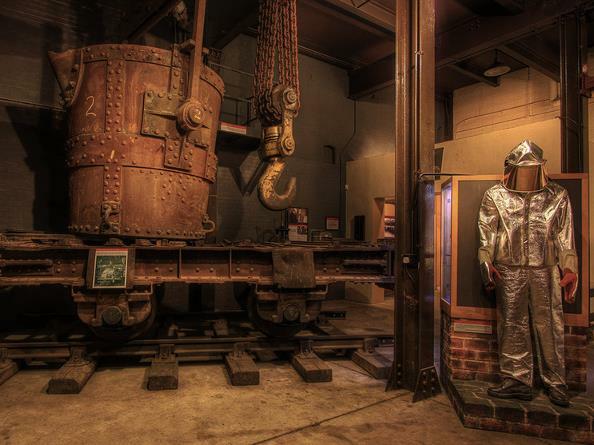 The first new exhibition area is all about one of Sheffield's most famous industries: steelmaking. Explore the history of steelmaking, its origins, the inventions, the workers, the products - large, small and shiny. From Benjamin Huntsman's invention of crucible steel in 1742, to Bessemer's mass production method in 1856, and Harry Brearley's discovery of stainless steel in 1913, our objects, photographs and activities will tell you all about it. Here, the growth from village to city is charted, using smaller objects to represent different periods in the city's production history. How growth in industry was tied into power sources such as water and steam is explored in the displays. Also featured is the effect that growth in industry had on the people who lived and worked in Sheffield. This display looks at the hand skills and trades particular to Sheffield. Find out about the terrible working conditions of an industrial town, the infamous Buffer Lasses, unemployment and the workhouse, illegal unions and the Sheffield Outrages. In this section, find out how large scale heavy industry took over Sheffield from the 1850s onwards and how the giant steelworks which dominated the east side of Sheffield were created. What effect did the industrial revolution have on the light trades of cutlery and tool manufacture? And what happened to Sheffield during the First and Second World Wars? Find out what Sheffield's industries are today. The area looks at Sheffield's role in creating Victorian Britain and the Empire, and the recognition the city gained through its representation at the Great Exhibition. Visit the Little Mesters Street at Kelham Island Museum and see a hand forger and grinder at work in the reconstructed Victorian street. They are two of the few remaining craftspeople still operating out of workshops in Sheffield. Often described as the backbone of Sheffield's cutlery and toolmaking industries, the Little Mesters were a network of craftspeople working out of small rented workshops. At the height of their population in the mid 1800s, these self-employed workers were making a vast contribution to the variety of products which bore a Sheffield stamp. Their reputation is one of skilled work and quality products. Opened in October 2005, the Transport Gallery showcases some of the finest Sheffield-made vehicles of the 1920s. The most famous is the Sheffield Simplex, a car built to rival the Rolls-Royce! Find out more about transport in Sheffield over the centuries and watch our DVD of travel and transport manufacture in the city. From the Transport Gallery floor, you can also view our Open Store and find out more about the fascinating collections behind the scenes at the Museum. You can also view the Conservation Workshops where the Museum's collections are cared for by our engineers. The Hawley Gallery opened in March 2010 to house the world renowned tool collection of Ken Hawley. The exhibition galleries are stacked full of objects and photographs from our collections to examine, watch moving, touch and listen to. We also have trails, colouring sheets and children's books for our younger visitors, as well as puzzles and activities on steelmaking and life at home. For visitors who wish to learn more about diverse aspects of Sheffield's history, we have two research areas where you can sit and read about Workhouses, Religion, Leisure and histories of some of Sheffield's most famous firms. The Melting Shop is an interactive play zone suitable for children aged between 2 and 9. Children clock in, are processed like steel, melted, rolled and hammered! The Melting Shop has recently been refurbished is now open during the Sheffield school summer holidays - please watch for updates. Groups need to book ahead for the Melting Shop - please contact the museum. The shop sells a wide range of quality gifts Made in Sheffield. Please call 0114 2722106 for more information. Little Mesters is a relaxed cafe throughout the week and a vibrant bistro during the evenings at the weekend. There is a wide choice of food and drink options at Little Mesters. Follow signs for A61(n) then follow white on brown tourism signs to Kelham Island. Postcode for Sat Nav users is S3 8RY. Car parking is included in admission but spaces are limited. Accessible by Public Transport: Sheffield station is 2 miles away.